A new version of QuickTime, Apple's multimedia software, arrives soon. Many Mac users may know QuickTime only as the thing that helps them play movies with their iMac. Yet, QuickTime may be a big reason Apple has held its own in a computer marketplace where cheapness and Windows seem to matter most. 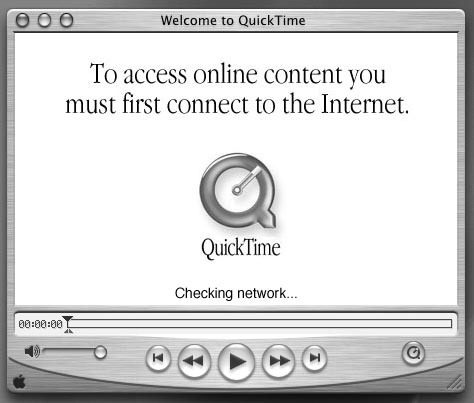 Waiting for Network: This greets when you first open Apple's QuickTime Player 6, the integral utility and default movie player that comes with QuickTime. Apple's multimedia tools now expect an "on-all-the-time" internet connection. 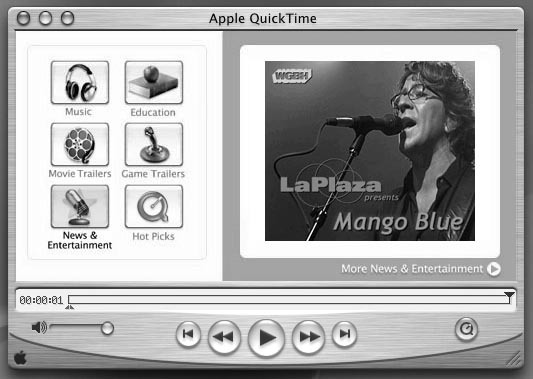 QuickTime has given Apple's Macintosh a premiere spot in the multimedia authoring industry. As an under-the-hood software toolkit that allows video, images, sound, and graphics to all work together in time, QuickTime has become as important to desktop digital movie making as Adobe Postscript type and laser printers have been to desktop publishing. But just as QuickTime has been a mainstay of multimedia and digital video authors, it has struggled to gain wide acceptance as a standard delivery format on the Internet. Apple's corporate propaganda speaks to QuickTime's great popularity, but most websites I visit with "movies" or "streaming" video and audio offer only "MP3" files, or formats incompatible with QuickTime such as "Real" video and audio and some format from Microsoft. Alas, even the media firm where I work doesn't support QuickTime files on its web servers. Just Like Cable TV: You'll benefit most from QuickTime 6's new viewing features if you have a high-speed internet connection. Upon opening QuickTime Player you'll be greeted with a screen like this, which leverages QuickTime's "interactivity." Click on one of the buttons at left and you'll be taken to a new "channel" of movies or music presented via Apple's website. Now Apple has just released a "public preview" version of QuickTime 6, its next-generation multimedia software. If ever Apple has a chance to gain a stronger foothold in Internet-based media delivery, QuickTime 6 with its support for next-generation MPEG-4 audio and video could be it. 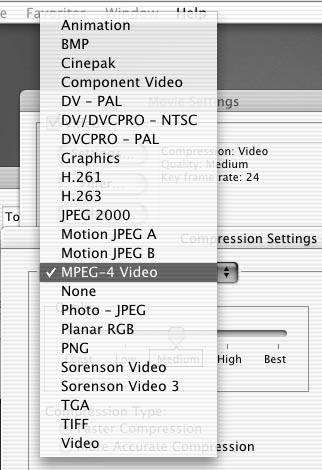 New Choices: If you create Quicktime movies, you'll find an MPEG-4 compression option in QuickTime 6. MPEG-4 provides as fine quality as any option previously available in QuickTime. 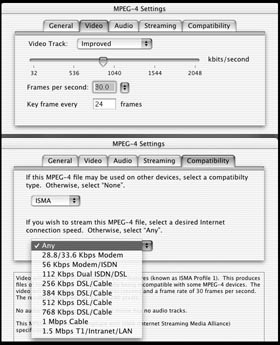 Besides letting you export movies to MPEG-4 format for use with devices other than typical desktop computers, QuickTime 6 also allows creation of QuickTime movies using a special Apple-created MPEG-4 codec, or compression tool, for creating movies meant for computer playback. MPEG-4 offers a new and improved file format beyond MP-3 that supports creation and playback of high-quality video and audio. In fact, a few years back when MOEG-4 standards were set, they were based around Apple's QuickTime file format. For users this means that MPEG-4 format files by nature will be QuickTime compatible, and MPEG-4 files created by QuickTime should play for anyone using other computer platforms or entertainment devices with MPEG-4 players. MPEG-4 is seen as a universal format that will play on wireless devices, set-top consoles and digital television. We can only hope this scenario works as planned. Not surprisingly, Microsoft has not joined a consortium of firms agreeing on specifics of MPEG-4 implementation. It's important to keep in mind what happened with Java: Sun Microsystems' Java language was designed for compatibility across all computer platforms, yet Microsoft, in its quest to assure Java worked "better" with its own products, conjured ways to make Java incompatible with Java. What will QuickTime 6 offer end users like us? This depends on how you use QuickTime files, and whether you have a dial-up or high-speed broadband Internet connection. Added benefits you get from QuickTime 6 also will depend whether you only play QuickTime-based video and audio, or if you also use QuickTime Pro or other programs to create and publish QuickTime files to disk (like CD or DVD) or the Internet. In general, it appears QuickTime 6 expects an "on all the time" Internet connection; usually this means some sort of high-capacity connection such as cable modem, DSL line, or T1 line. When I first opened QuickTime Player 6, the "movie" window opened with this notice "to access online content, you must first connect to the Internet…checking network." I did not have a network connection, as I had not dialed it. As to movie creation and playing, the MPEG-4 format appears to produce great-looking movies. My experience is anecdotal: I've downloaded and viewed the QuickTime 6 movies from Apple's website, have compressed a few clips from my own DV footage and created slide-show type movies from still images. In, general file sizes appear comparable or less than similar QuickTime movies produced by the "Sorenson" compressor, QuickTime's previous "champion" format for high-quality video files. 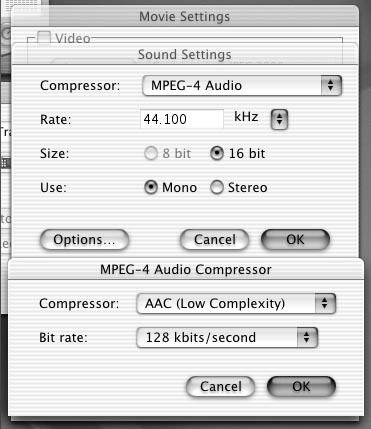 Audio MPEG-4 files also sound wonderful. 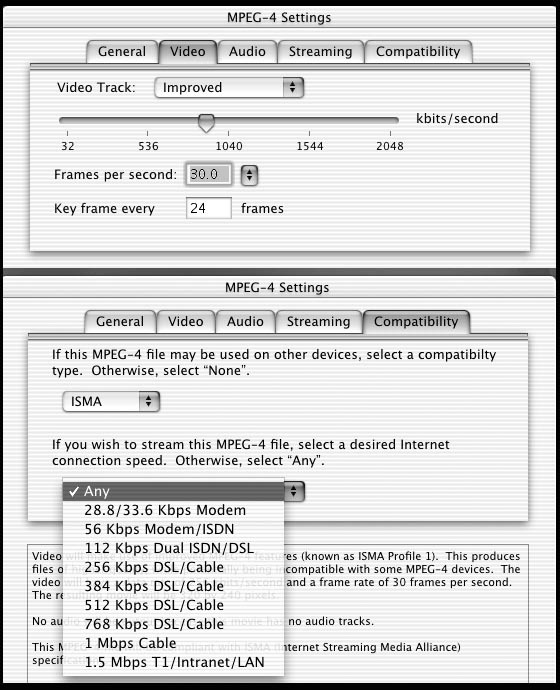 An important aspect about MPEG-4 in QuickTime may not be what you see, but what you don't pay for. Before MPEG-4 in QuickTime, if you wanted to create optimum quality QuickTime movies using the Sorenson format, you had to pay $500 for the "Pro" Sorenson compression add-on to QuickTime. Custom Audio: Creation of MPEG-4 audio also comes as part of QuickTime 6 Pro. When you convert an existing audio file such as AIFF, you'll see these two screens when choosing audio quality and file size. Apple says the MPEG-4 audio options in Quicktime 6 are called "Advanced Audio Compression," or AAC. The price of upgrading to QuickTime Pro 6 has not been established because Apple is still negotiating rates with the MPEG licensing authority. Apple has said anyone with existing QuickTime Pro 5 licenses will have to pay to upgrade; QuickTime Pro 6 may cost more than the $30 previous "Pro" versions cost. Regardless, if you plan to create MPEG-4 movies in QuickTime you should be able to get very high quality files for much less cost than using the Pro variant of Sorenson format. That said, if all you do is play movies that others create, the upgrade to QuickTime 6 should be free, at least it has been for all previous versions. Besides MPEG-4, and support for all file types supported by earlier versions, QuickTime 6 will offer other improvements. These include "instant on" and "skip protection", features that improve delivery of video streams over the web. If you use Mac OS X you can export still images from QuickTime in the new JPEG 2000 format. QuickTime 6 also supports Flash 5, DVC Pro video in PAL format, and improved Applescript support. Apple's been pushing hard for users to accept Mac OS X and company leader Steve Jobs has announced no more development of Mac OS 9. Yet the Apple website indicates that minimum standards for QuickTime 6 are a Power PC Mac and Mac OS 8.6. By the time you read this Apple may have released the final version. Until then visit http://www.apple.com/quicktime to download QuickTime 6 Preview. It's free, and during the pre-release period you can use QuickTime Player 6 for modest editing, MPEG-4 movie compression and file export if you already have paid $30 for QuickTime Pro 5. This is the best way to discover the potential appeal and possible impact of MPEG-4 on QuickTime and you. Pi member Dennis Dimick has been following the growth of Apple's multimedia software since he started his movie-making career (a.k.a. hobby) with QuickTime 1.0 in the early 1990's. He can be reached via email: ddimick@aol.com.